The SafetySure® Mobility Sheet (SSM Sheet) can be used to turn lift and transfer patients. Made of durable nylon fabric, the Mobility Sheet is available with or without a plastic insert. 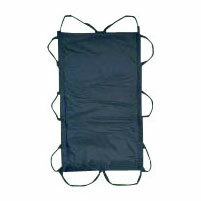 The plastic insert gives the Mobility Sheet extra rigidity, making it easier to slide under the patient. It also provides protection when transferring a patient from a soft to a hard surface. Both styles come with a sewed-in comfortable strapping that helps distribute the patient's weight evenly over the Mobility Sheet. The small sizes are ideal for moving pediatric patients. SafetySure Sit-Rite Directional Slide, 20" x 16-1/2"